Fresh oil palm fruit. WWF-Malaysia via the Sustainable Palm Oil programme is actively promoting best management practices to minimise impact on biodiversity and to avoid expansion into forested areas. 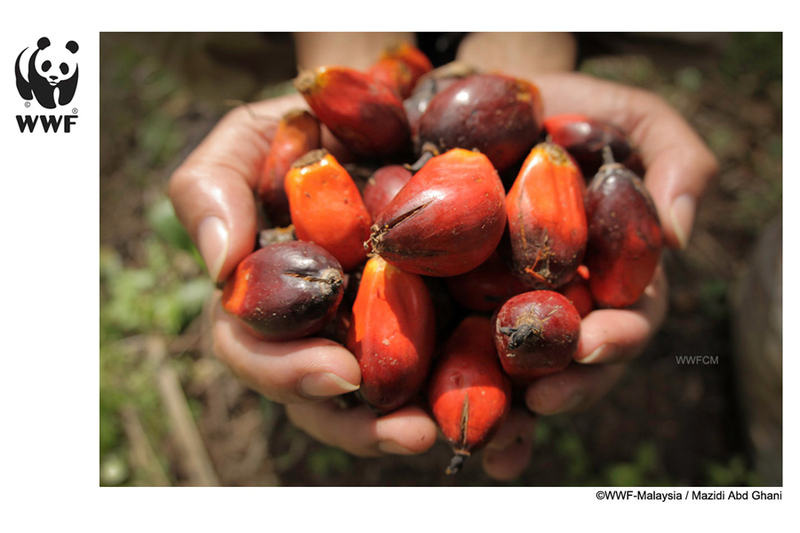 15 August 2014, Petaling Jaya: World Wide Fund for Nature – Malaysia (WWF-Malaysia) is ready to assist the palm oil industry to achieve sustainability through best management practices without impeding expansion and productivity. As such, it intends to intensify engagements with palm oil stakeholders at all levels such as the Malaysian Palm Oil Council and Sarawak Oil Palm Plantation Owners Association (SOPPOA) toward this end. It also welcomes SOPPOA’s recent statement on its focus to increase productivity while ensuring sustainability. WWF recognizes that the palm oil industry has huge economic and development potential which will benefit the population. In fact, WWF is a party to the Roundtable on Sustainable Palm Oil (RSPO) which is a global, multi-stakeholder initiative on sustainable palm. WWF particularly promotes sustainability in production of palm oil, soy and biofuel feedstock because these are the commodities where expansion is most threatening to sensitive environments and where climate change implications are most significant. “We would like to emphasize that WWF is not anti-palm oil. We receive no funding from any source to be anti-palm oil or to promote alternative source of vegetable oil. “WWF strives to ensure that the palm oil industry achieves productivity and sustainability through improvement in plantation management and mill performance,” said WWF-Malaysia’s Executive Director/CEO, Dato’ Dr Dionysius Sharma. He said WWF is glad to see that the RSPO voluntary certification was gaining momentum in the country. As of June 2014, RSPO certified plantations have increased to 3 million ha from 125,000 ha in 2008 and WWF welcomes more plantations and facilities to be RSPO certified, he added. WWF-Malaysia promotes RSPO certification along with the Guidelines and Best Management Practices (BMPs) that allows producers to meet the required standards to act as stewards of the environment. For example, through a compliance system, smallholders can enter the supply chain and sell fresh fruit bunches to certified palm oil mills. This is a win-win effort that generates sustainable income for local smallholders and at the same time increase the source of certified fresh fruit bunches. WWF also works on a suite of inter‐related strategies such as promoting stakeholder-driven land‐use planning, working with governments in both producer and market countries, and developing finance and investment safeguards that are compatible with RSPO principles. For example, we have held a biodiversity awareness workshop for smallholders together with the Malaysian Palm Oil Berhad (MPOB). During the workshop, it used RSPO as a platform for large palm oil buyers to share their experiences on sourcing sustainable palm oil on the ground. Recently in Sabah, WWF-Malaysia and Sabah Wildlife Department held a workshop on human-elephant conflict in oil palm plantations for plantation companies emphasizing the importance of forest conservation and responsible management. Participated by 11 plantation companies, the workshop promoted a greater understanding of the causes of conflict, and provided an opportunity for plantations to share success stories on managing conflict.